Today, The Book Monsters are hosting Geoff Rodkey, author of The Chronicles of Egg, an adventure series for middle grade readers with pirates ,a treasure hunt and much much more! Check out Kristen's review of Deadweather and Sunrise as well as New Lands. ​What kind of research, if any, did you do for New Lands? I did a lot of it, actually. 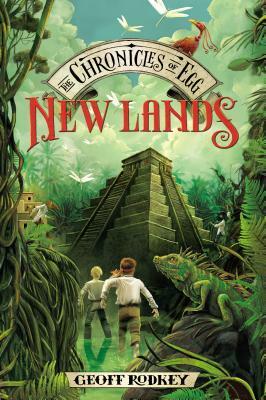 The world of The Chronicles of Egg is very similar to that of the Caribbean Sea and Central America during the colonial era, and in writing the series, I cherry-picked the most interesting things I found in various history books, while ignoring the more boring and/or depressing parts. The first book, Deadweather and Sunrise, was very pirate-heavy, so for that, I drew on books like Under the Black Flag and Empire of Blue Water, about the Golden Age of Piracy. New Lands mostly takes place in the equivalent of colonial Mexico and Central America, so a lot of the research came from books like Charles Mann's fantastic 1491 and 1493; Henry Kamen's Empire: How Spain Became a World Power; and The Conquest of New Spain, which is a 16th-century memoir written by a Spanish soldier who was present for Cortes's conquest of the Aztecs. The names in your books are very unique, how do you pick the characters' names? I wish I had a good answer for that. Mostly, they just pop into my head. And once they do, I usually just write them down without second-guessing them too much. As a kid, I loved just about anything by Beverly Cleary, Judy Blume, Lloyd Alexander, S.E. Hinton, T. Ernesto Betancourt, Katherine Patterson, and Paula Danziger. I also have fond memories of The Westing Game. But my favorite book from that age was probably The Pushcart War, which is out of print but worth tracking down in a library or online from a used bookstore. It's about a fictional war on the streets of New York City between a group of more-or-less evil truck drivers and the pushcart peddlers who decide to fight back against them, and it's fantastic–really funny, but also touching. If you were to write a book about your life, what would the title be? What's next for you? Are you currently working on or have plans for future projects? I'm still finishing Blue Sea Burning, which is the last book in the Chronicles of Egg trilogy, and I've been rewriting a TV movie for the Disney Channel that'll hopefully see the light of day at some point. When those have wrapped up, I'm going to start work on another middle grade series. Thank you Geoff for stopping by today! Also, we have a great prize pack of both books to giveaway to one winner! These look great for my kids and I. I also loved Judy Blume growing up. another series i have to add to my WishList!!! yes, i will be reading this first before sharing it with my (MUCH) younger cousins!! Is this the first book in the series or the 2nd? You loved all the authors I did growing up. I look forward to reading this one and recommending it to the middle grade readers I know.